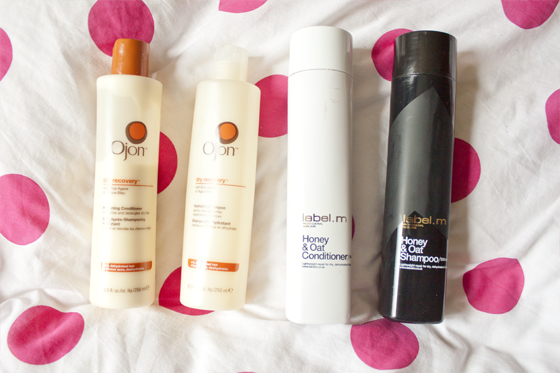 Shampoo and Conditioner: At the moment I'm using two different Shampoo and Conditoner's: the Label M. Honey and Oat Shampoo and Conditioner and the Ojon Dry Recovery Shampoo and Conditioner. As my hair is fairly thin and fine I try not to use too weighty products but my main concern with my hair is it's dryness so I will normally pick a shampoo and conditioner for dry hair rather than one that adds body and volume. I wash my hair almost everyday as I work out alot, but on weeks when Im a bit lazy and not working out I wash my hair every three days. Treatments: My all time favourite hair mask is Philip Kingsley Elastizer, Nothing I've ever used has left my hair so soft and nourished. I tend to use this once a week, or every 10 or so days. It's fairly expensive so I don't like to buy it very often! For a cheaper treatment I use the VO5 Moisture Mask as a in shower treatment. I use this probably twice a week as I really like the way it leaves my hair feeling. I always use a hair oil before I dry my hair too, Im currently using the Organix Morrocan Argan Oil in Morrocan Oil packaging because I prefer the pump action. I run about 4-5 pumps through the hair and then blow dry with a round brush. 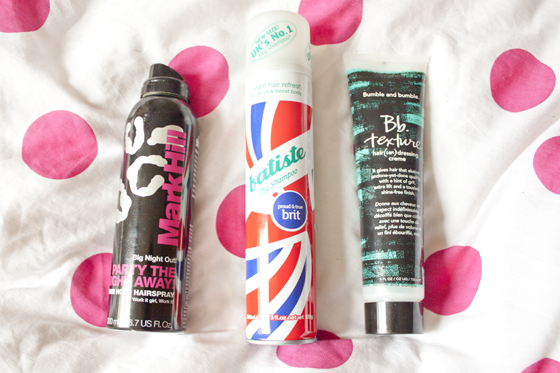 Styling: The only product I use religiously is the Bumble and Bumble Texture Creme. 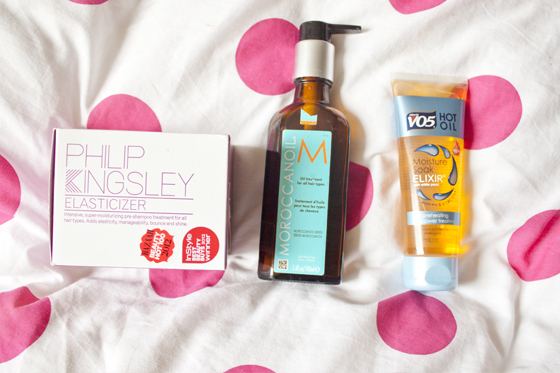 I apply it to damp hair on the mid lengths and roots and then blow dry. I don't always use hairspray, It irritates my eyes most of the time so I skip it unless Im going on a night out or leaving the house and only use it when I style my hair with a curling iron. I would typically flip my hair over and spray either Ojon Volumising Hairspray or the Mark Hill Party the Night Away hairspray. 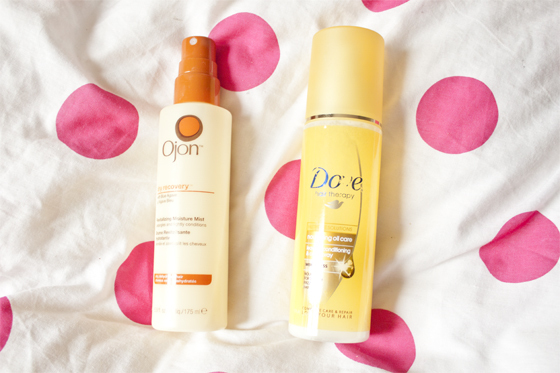 The Ojon one is probably the most heavy duty hairspray and the Mark Hill is lighter but has a firm hold.